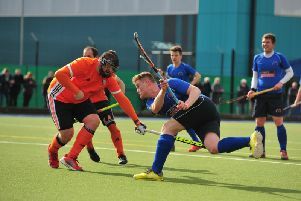 Harrogate Hockey Club Ladies 1st XI extended their unbeaten run to five games when they overcame Lymm 1s in North Division One. Rachel Till’s side had drawn their previous two fixtures, but made a return to winning ways courtesy of a 2-0 success away from home. ‘Gate threatened early on but were unable to find a breakthrough, while the home side looked dangerous on the counter-attack but found visiting goalkeeper Caz Hurst in no mood to give up her clean-sheet. With the interval approaching, the Ainsty Road outfit cranked up the pressure annd saw two ‘goals’ disallowed. A short-corner from Megan Clark was fired too high in to the net before an obstruction thwarted Evelyn Wright’s finish. Harrogate were not to be denied, however, and on the stroke of half-time they were awarded another short-corner thanks to the efforts of Freya Wilde, and this was converted by captain Till. The second period followed a similar pattern, with the visitors seeing plenty of the ball but Lymm remaining a threat on the break. Hurst made a stunning save, tipping the ball over the crossbar, and Lucy Wood cleared off her own line as ‘Gate worked hard to keep their slender advantage intact. Having weathered the storm, the away side then wrapped things up in the final minute when Wood finished well from another short-corner. Victory sees the 1st XI climb one place up to sixth in the league standings. The Ladies 2s produced their most determined performance of the season, fighting back to beat Wakefield 3s by a 2-1 scoreline. ‘Gate began well and the pace of player of the match Lily Wheat caused the visitors all sorts of problems. Wakefield improved steadily as the half progressed, but some good work from home keeper Maddy Boocock and her defence ensured that the game remained goalless at half-time. The West Yorkshire side did take the lead in the second period, but falling behind seemed to stir Harrogate into life and they equalised from a penalty-corner. Ali Wales initially saw her her strike blocked on the line, only for Sophie Normand to lift the rebound into the net. The hosts’ winner also came from a penalty-corner, Nikki Gill scoring with a slap from the right hand-side of the circle to earn her team a hard-fought victory. ‘Gate Ladies 3s triumphed 3-1 at Bingley Bees 1s. Sarah Parker-Walton opened the scoring and Maggie Pimley doubled the lead before the Bees hit back. Gabi Wilkinson’s second-half goal then sealed the win. The 4th XI lost out 2-0 at home to Leeds Adel 4s.